At the surface an underground mine might appear to cover a relatively small area, but this may be quite deceptive of its actual size. Even back around 1850 the mine that James Dunn worked in extended out more than a mile from the shaft. As they extended, so the areas that were worked left pillars that might contain up to 40 – 50% of the coal in place, but had to be left to hold the roof up. 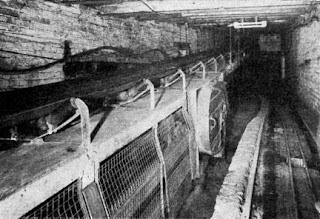 The miners drove “headways” into the coal that were connected by cross passages or bords. At Houghton Colliery, for example, the pillars would be 5.5 yards deep, while the headways were 2 yards and the bords were 3.5 yards wide. The headways would advance about 20 to 40 yards before a cross drift was drive to hole through and create a new bord, along which the ponies would bring the empty tubs, and haul away the full ones. 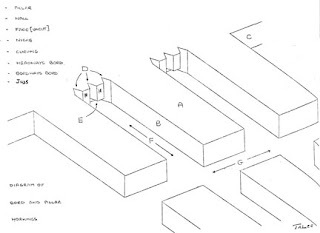 The method of mining the face can be seen in the drawing, first it was undercut, then three vertical cuts were made (the nicks) and then the intervening coal could be broken out in the larger pieces that were favored by those buying the coal. Back then the tubs of coal were moved from the working face to the shaft by teams of boys and men. But that only worked when production rates were relatively low. As the demand for coal grew with the Industrial Revolution, so the need to produce coal in greater volumes, and to move it faster to the shaft grew. Pit ponies went underground, but would only pull a certain (small) number of tubs, and so better ways were needed. 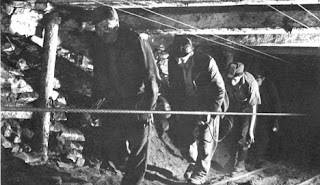 With the coming of electricity, this turned into the use of long “endless” ropes that wound their way along the centers of the rail lines into the depths of the mine. Hauling the tubs in either direction meant manually attaching a front shackle or chain to the moving rope, which then pulled the set of tubs down the passage in the direction required. Usually these systems were restricted to the main haulage ways or “Mains” since the ability to turn corners was limited. The main drive engine was usually by the shaft, and when the rope was not moving continuously it could be engaged by signaling the operator through a series of bells and cables. (The wires above the pitmen's heads). In an alternative method of haulage the rope was attached to the front of the set of tubs, while a second rope was attached to the tail end of the set. (Hence the name Main and tail). Thus as the tubs were pulled into the mine (inbye) they extended the rope that would later be used to haul them back out (outbye). But again these systems were largely kept in the main haulage parts of the mine. Once they reached the area where mining was continuing (the working “district”) they would be broken loose and could be hauled further by the pit pony. 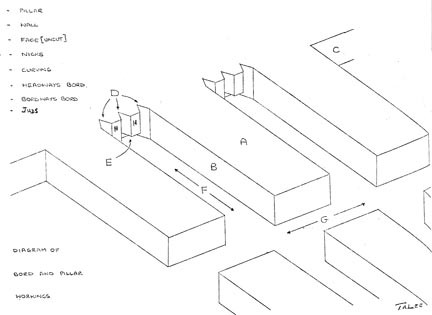 Thus on the map of the mine, the mains could be identified as the two parallel tunnels that would run out from the shaft in the four main directions (though this was oriented to the patterns of fractures in the coal, or cleat, rather than the compass points). 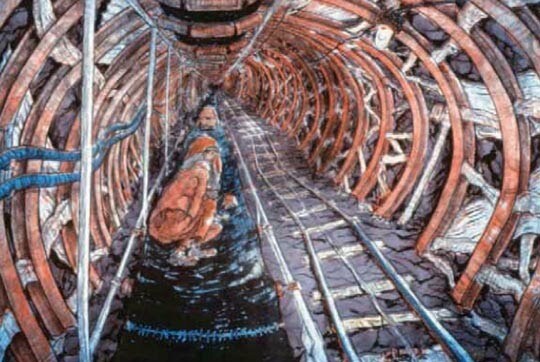 Full sets would then be reassembled after they were brought back from the working face and hauled back to the shaft. While the coal was mined by hand, and then loaded out by hand this system remained capable of handling the production. It is still, apparently, used in China. 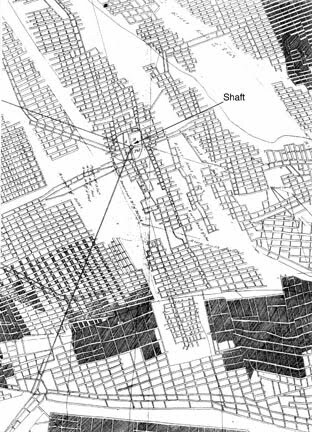 However, as mines grew larger, the inflexibility of the system, and its intermittent nature reduced its popularity. It was still around, however, in the early 1960’s since I spent an uncomfortable week or two of my apprenticeship working the engine on the maintenance shift, where the rope was only needed a few times in the shift to move tubs. It was there I discovered that by just cracking the engine on, the current running through the resistance bank would slowly heat it up, while the engine had not enough power to turn. This could, as long as a) you didn’t get caught and b) the rope didn’t move, keep you warm in the cold air of the downshaft flow. A better way was needed for hauling coal from the face, and this came with the development of the conveyor belt. Initially mining belts were relatively simple. Long flat strips of reinforced rubber belting would be joined at intervals with wire clips, to form a loop. This was, in turn driven by a motor at one end, and a tensioning return drum arrangement at the other. Miners could load the coal onto the belt, and this would carry it out of the district, where it would transfer to a second conveyor belt that would carry it to the mains, where it would transfer to a much large belt, now carried on rollers, often suspended from the roof, that would carry it to the shaft, or in shallow mines out to the surface. 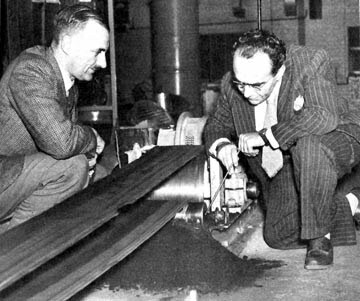 One of the reasons for the suspension of the rollers rather than having them set in a frame resting on the ground is that it left clearance under the conveyor. Thus as small coal and dust fell off the conveyor it fell into a space where it could be seen and removed before it became a risk. If it was allowed to build up it could rub against the rollers, generating friction, heat and ultimately causing the coal to catch fire. The fire at a transfer point at the Cresswell Pit in the UK in 1950 created clouds of carbon monoxide, which flowed into the workings and 80 men died. Fires associated with poor belt maintenance and failure to remove the coal powder that accumulates around the transfer points and similar locations, are, sadly, still occurring even within the past month. They don’t have to be underground and one of the major problems created is the smoke that is formed, which can very rapidly make it impossible to see. Conveyor belts do, however, when properly maintained, provide a relatively rapid and simple method for getting the coal from the working area to the shaft or out of the mine. They can even (in some cases officially) provide a way for miners to ride their way out of the mine at the end of the shift. Harvey Manrider (lithograph 1979 Tom McGuinness) Note the rope between the rails, which is still used to haul tubs of supplies in to the face. (The single rope would mean a Main and Tail haulage). You just had to stay awake enough to get off the belt before the next transfer point.